Isolation of a concentrated, living preparation of malarial parasite-infected red blood cells (PRBCs) that have low contamination of white blood cells (WBCs) facilitates research on the molecular, biochemical and immunological aspects of malarial parasites. This is currently carried out by a two-step method, including the concentration of PRBCs using density gradient centrifugation through Percoll or Nycodenz, followed by the removal of host WBCs using a cellulose powder column or a commercially available filtration unit. These two-step methods can help isolate sufficient PRBCs, but they are laborious. In this study, a simplified one-step procedure that takes advantage of the difference between diamagnetic low-spin oxyhaemoglobin and paramagnetic haemozoin (haem polymer) was described. The paramagnetic polymer is deposited in the food vacuoles of the parasite, allowing the use of magnetic separation to efficiently and rapidly concentrate PRBCs while removing contaminating host WBCs. The magnetic removal of WBCs using a commercial LD column (MACS) was evaluated as a new method for concentrating and purifying PRBCs. To compare this method with the two density gradient centrifugation methods using Percoll or Nycodenz, we analysed the quantities of enriched PRBCs and contaminating host WBCs as well as the viability of malarial parasites in the final preparations. The quantity of PRBCs and the viability of malarial parasites in the isolated PRBCs were similar between magnetic and centrifugation methods. However, 90–99% of the contaminating WBCs were removed from the starting material using a magnetic column, whereas WBC content did not change using the Percoll or Nycodenz methods. The use of a commercially available magnetic LD column is effective, safe and easy for the one-step purification of PRBCs. This simple method does not affect the viability of malarial parasites. Malaria is one of the most common diseases in tropical countries. Each year, there are 300 million new malaria infections and millions of deaths due to malaria throughout the world. The fast spreading resistance to current quinoline antimalarials has made malaria a major global problem . Because a vaccine for malaria is not available, it is necessary to study the molecular, biochemical and immunological aspects of malarial parasites to develop vaccines and new antimalarials. The ability to obtain numbers of living parasite-infected red blood cells (PRBCs) greatly facilitates research on malaria. The current method for isolating PRBCs is based on density gradient centrifugation through Percoll [2–4] or Nycodenz [5, 6]. Because red blood cells infected with mature stages of P. falciparum (trophozoites, schizonts, and gametocytes) have a distinct density, they can be easily separated from the heavier uninfected and ring-stage-infected erythrocytes by density gradient centrifugation. However, this method is unable to separate PRBCs from host white blood cells, due to their similar densities [2, 3]. Because contamination of the preparations with WBCs is a problem for molecular biological studies, additional purification steps, such as a cellulose powder column  or a commercially available filtration unit [8, 9], are employed to remove host WBCs. The combined use of the two steps produces sufficient PRBCs, but the method is laborious. During development and proliferation in host erythrocytes, the malarial parasite degrades haemoglobin for use as a major source of amino acids. This is accompanied by the release of free haem. Free haem is oxidatively active and toxic to both host cell and malarial parasites and causes parasite death. To protect itself, the malarial parasite detoxifies free haem by neutralizing it by means of histidine-rich protein 2 (PfHRP2) , polymerization of haem into haemozoin (water-insoluble malarial pigment) in the food vacuole , or degradation by reduced glutathione (GSH) [12, 13]. Previous authors have proposed taking advantage of the difference in magnetic state between oxyhaemoglobin, which is low-spin and diamagnetic, and haemozoin, which is a paramagnetic polymer to concentrate P. falciparum PRBCs [14, 15]. This study further indicates that a single step using only a commercial magnetic LD column (MACS) can concentrate Plasmodium berghei PRBCs and also remove almost all of the contaminating WBCs. Percoll was from Amersham Pharmacia Biotech (Uppsala, Sweden). Nycodenz powder was from Life Technologies, Inc. Ltd. (Paisley, UK). Six to ten week old male mice (ddY strain) from Japan SLC Company (Hamamatsu, Japan) were used in all experiments. LD columns and magnetic units (midiMACS) were from Miltennyi Biotec (Bergisch Gladbach, Germany). The parasite P. berghei (NK65 strain, gift of Dr. Waki, Gunma Prefectural College of Health Sciences, (Gunma, Japan) was passaged by weekly intraperitoneal injections of infected blood into ddY mice. RPMI-1640 medium was obtained from Gibco (Paisley, UK). Infected blood was obtained by cardiac puncture under ether anaesthesia. Before processing the samples, thick and thin smears were made, stained with Field's stain, and then examined under a microscope to record parasitaemia and percentage of leukocytes. The blood was suspended in an equal volume of PBS and centrifuged at 200 × g for 3 min. The pellet containing erythrocytes was washed three times with PBS and resuspended in nine volumes of RPMI-1640 to make a 10% suspension of erythrocytes. Three ml of the 10% suspension were withdrawn and divided into three equal parts, and each 1 ml was used for isolating PRBCs by the three different methods. Fifty microliters of blood was used for the analysis of WBC DNA. Isotonic Percoll was prepared with slight modification of previous study . Isotonic Percoll was prepared by adding 60 ml of Percoll to 7 ml of 10 × concentrated PBS. By adding 33 ml of PBS, Percoll prearation was diluted to make 60% Percoll. Two ml of 60% Percoll was gently placed with a Pasteur pipette at the bottom of a 10% suspension of erythrocytes (1 ml) obtained from blood of 5–10% parasitaemia. After centrifugation at 1,450 × g for 20 min, one layer of packed cells was observed at the sample/Percoll interface. The interface was collected with a Pasteur pipette, washed three times with PBS by centrifugation, and suspended in 1 ml PBS. The obtained PRBC-enriched fraction was evaluated by analysis of the percentage of PRBCs to total red blood cells and the ratio of WBCs/ PRBCs after its smear was stained by Field's stain. Nycodenz was prepared as described in previous study [5, 6]. A Nycodenz stock solution was prepared from 27.6 g solid Nycodenz dissolved in 60 ml buffered medium (5 mmol/l Tris-HCl, pH 7.5 containing 3 mmol/l KCl and 0.3 mmol/l CaNa2EDTA), made up to 100 ml with the same medium, autoclaved, and stored at 4°C. A 55% Nycodenz/PBS solution (v/v) was prepared from the Nycodenz stock solution. Two ml of 55% Nycodenz was gently placed at the bottom of the 10% suspension of erythrocytes (1 ml) with a Pasteur pipette. After centrifugation at 1,450 × g for 20 min, one layer of packed cells was observed at the interface. The interface was collected with a Pasteur pipette, washed three times with PBS, and suspended in 1 ml PBS. A smear was prepared and Field's stain was used to count the percentage of PRBCs to total red blood cells and the ratio of WBCs/ PRBCs. One ml of the 10% suspension of erythrocytes was applied to a LD column assembled in a magnetic unit, and washed with 20 ml PBS to remove non-infected erythrocytes and WBCs. After the effluent from the column became almost colourless, the magnet was removed, and the cells retained in the column were eluted with 1 ml PBS. Thus, the PRBC-enriched fraction was obtained. The percentages of PRBCs to total red blood cells and the ratio of WBCs/PRBCs were determined after its smear was stained by Field's stain. The viability of parasites in the three PRBC preparations was determined by monitoring parasitaemia and survival time of mice after intraperitoneal injection of 105 purified PRBC into three groups of four mice. Blood parasitaemia was monitored by tail blood smears after Field's staining. Red blood cells were lysed as described previously  with slight modifications. Fifty microliters of blood was lysed by adding 50 μl of 0.4% saponin in PBS for 5 min at room temperature with intermittent mixing. Tubes were centrifuged 600 × g for 5 min, and the WBCs pellet was washed twice in PCR solution A (10 mM Tris-HCl, pH 8.3 containing 100 mM KCl and 2.5 mM MgCl2) and resuspended in 50 μl solution A.
WBC DNA was prepared from 50 μl of WBC suspensions in solution A by adding an equal volume of PCR lysis solution B (10 mM Tris-HCl, pH 8.3 containing 2.5 mM MgCl2, 1% Tween-20, 1% Nonidet P-40 and 0.4 mg/ml proteinase K). WBC DNA was obtained by incubation at 60°C for 1 h with mixing on a vortex every 20 min, followed by incubation at 95°C for 10 min to inactivate proteinase K.
PRBC-enriched samples were analyzed for the presence of WBC DNA as a semi-quantitative determination of contamination with WBCs. WBC DNA was detected by amplification of the mouse Y-chromosome target gene using sequence-specific primers. The mouse Y-chromosome primer pair (GAG AGG CAC AAG TTG GCC C) and (CTT TAG CCC TCC GAT GAG GC)  was used for the PCR reaction. Normal blood with different dilutions were used as markers for number of WBCs. Twenty five μl of the lysate containing WBC DNA was added to 50 μl of PCR mixture consisting of 5 mM MgCl2, 2 mM dNTPs, 5 μl of 10X KOD-dash buffer, 2 pmol per μl of each primer and 0.04 U per μl of KOD-dash polymerase. The mixture was amplified for 32 cycles of 95°C for 30 sec, 62°C for 1 min and 72°C for 2 min. Amplified products were detected by ethidium bromide staining after 2% agarose gel electrophoresis of PCR reactions. PRBCs can be concentrated to greater than 90% of the total cells using density gradient centrifugation through Percoll  or Nycodenz . This study compared the efficiency of three methods for the concentration and purification of PRBCs: density gradient centrifugation methods using either Percoll or Nycodenz and a magnetic method using an LD column. PRBCs were concentrated from 0.8 ml of infected blood containing 5–10% parasitaemia and suspended in 1 ml of PBS, and the numbers of total recovered cells were counted using a haemocytometer. PRBCs were counted following Field's stain (Fig. 1) to calculate the percentage of PRBCs. Using the Percoll and magnetic methods, PRBCs constituted 97% and 98% of the total recovered cells (Table 1), respectively, while the percentage of PRBCs after concentration by Nycodenz method was slightly lower. These results suggest that the magnetic method using the LD column is as effective as the centrifugation methods for concentrating PRBCs. Photomicrographs of Field's-stained P. berghei-infected blood. 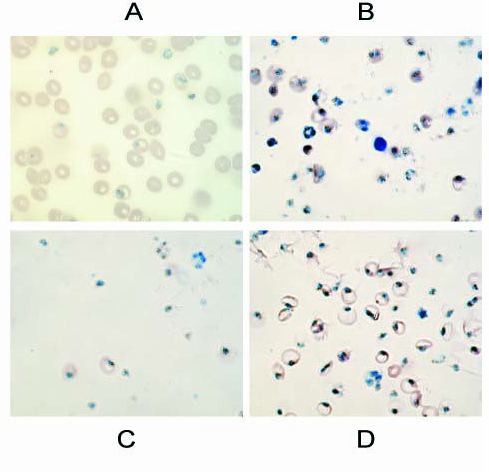 Peripheral infected blood from infected mice (5% parasitaemia) (A); and PRBC-enriched fractions concentrated by Percoll (B), Nycodenz (C) and LD column (D). Numbers of total cells and PRBCs purified by three methods. The erythrocyte suspension (10%) was prepared from 0.8 ml of blood infected with malarial parasite (5–10% parasitaemia) as described in Materials and Methods. Three ml of 10% erythrocyte suspension was withdrawn, divided into three equal parts (1 ml each), and used in the three methods to concentrate PRBCs. After purification, the PRBC-enriched samples were suspended in 1 ml PBS. The numbers of total cells after concentration were recorded using a haemocytometer, and the number of PRBCs were determined by Field's stain. The results are representative of 3 different infected blood samples. Because a magnetic field at 5 Hz has been reported to affect the growth of P. falciparum in vitro , the effects of the three methods on the viability of parasites in the PRBC preparations were evaluated. After concentration by three methods, 105 of each PRBC preparation were injected into three groups of mice and then parasitaemia and the number of survival days were monitored. The results showed that all mice died at ten-day post-infection and that the change of their parasitaemia was nearly identical among three groups (Fig. 2). This indicates that magnetic LD column did not affect the ability of the parasites in the concentrated PRBCs to develop normally in vivo. Characterization of parasites in PRBCs. PRBCs (105) were purified by three methods. Parasitaemia was monitored following intraperitoneal injection of PBRCs into four mice per group. A blinded analysis was performed to determine the contamination level of the PRBC preparations with WBCs. Two microscopists independently analysed 7 infected blood samples containing 5–10% parasitaemia. The magnetic purification method yielded only approximate 8.0 ± 2.1 leukocytes per 5,000 PRBCs, while 124.4 ± 4.3 and 126.5 ± 7.0 WBCs were present per 5,000 PRBCs after the Percoll and Nycodenz centrifugation methods, respectively. These results indicate that approximately 93.7% of the leukocytes were removed by the one-step purification using magnetic LD column, and that the centrifugation methods did not effectively remove WBCs (Table 2). Evaluation of WBC contamination of PRBCs purified by three methods. WBCs before and after purification with Percoll, Nycodenz or magnetic methods were counted blindly and independently by two microscopists. Seven infected blood samples containing 5–10% parasitaemia were independently used in this study. In order to confirm these results, an alternative method was used to detect contaminating WBCs in PRBCs-enriched fractions. PCR was performed to detect Y chromosome DNA as a marker of leukocytes from male mice. The results showed that the PCR signal from the PRBCs isolated by magnetic LRB column was markedly lower than the signals from the PRBCs isolated by the two centrifugation methods (Fig. 3). A series of dilutions of normal blood was used as a standard to evaluate the efficiency of leukocyte removal. The PRBC sample obtained by the magnetic method showed a PCR signal similar to normal blood markers from 100- to 1000-fold dilutions. In contrast, the PRBCs isolated by the two centrifugation methods gave PCR signals approximately the same as undiluted normal blood. These results confirm that the magnetic method using the LD column is effective not only for concentrating PRBCs but also for removal of contaminating leukocytes. Semi-quantitative analysis of WBC contamination in purified PRBCs by PCR. WBC DNA was isolated from PRBC-enriched fractions and different dilutions of normal blood. PCR was performed to detect Y chromosome DNA as a marker of leukocytes from male mice. Normal blood with different dilutions was used as a marker to evaluate the quantity of contaminating WBCs. These data are representative of three independent experiments. PRBC-enriched fractions isolated by the magnetic (Lane 1), Nycodenz (Lane 2) and Percoll methods (Lane 3). Normal blood diluted 104-fold (Lane 4), 103-fold (Lane 5), 102-fold (Lane 6), 10-fold (Lane 7) and undiluted (Lane 8). Many previous studies have used density gradient centrifugation through Ficoll , Percoll [2–4] or Nycodenz [5, 6] to concentrate PRBCs. This method can concentrate PRBCs effectively and recover a high level of malarial parasites . However, the presence of a high level of contaminating WBCs in these preparations can cause several problems. For example, the biological activities of the leukocytes, such as phagocytic activity, can damage the parasites. In addition, the synthesis of WBC biopolymers can interfere with the quantitative analysis of parasite activity . Therefore, a new method was needed to isolate PRBCs with a high recovery rate of PRBCs but with a low level of contamination with WBCs. A Percoll gradient has been used to concentrate the mature asexual erythrocyte stages of Plasmodium from infected bloods in one step . It also has been reported that a single step of Nycodenz-gradient centrifugation enriches different developmental stages of Plasmodium [5, 6]. Using these techniques, PRBCs could be concentrated to greater than 95% of the total cells, but the fraction contained, on average, one WBC per 500 PRBCs . In this study, in the experiments using Percoll method and Nycodenz-based separation, this ratio was worse at 124.4 ± 4.3 and 126.5 ± 7.0 WBCs per 5,000 PRBCs. These results are predictable, because the density of PRBCs (1.053–1.086) is significantly identical with that of WBCs (1.062–1.086) . To resolve this problem, cellulose powder  or a commercially available filtration unit has been employed after the concentration of PRBCs by the centrifugation methods [8, 9]. The cellulose powder could remove 95–99% of WBCs from the PRBC-enriched fraction. A combined use of the filtration or cellulose powder and density gradient centrifugation steps can be used to enrich PRBCs, but it is a laborious procedure. In addition, some of the PRBCs are lost by adsorption to the cellulose powder . Percoll  is reported to affect the qualities of PRBCs. Density gradients of Percoll can be made with its osmotic or viscosity effect on the viability of the parasites. However, silica particles, a component of Percoll, are known to affect PRBCs . Likewise, the magnetic field at 5 Hz has also been suggested to reduce the qualities of PRBCs by inhibiting the polymerization of haem into haemozoin or by mechanically damaging the organelles in the malarial parasites . However, the results of the present study indicate that PRBCs purified by three methods have identical qualities (Fig. 2), suggesting that the magnetic field used in the LD column does not interfere with the in vivo viability of PRBCs. The present study shows that a one-step magnetic method using a commercially available LD column is an effective, rapid and simple method for the concentration and purification of PRBCs as well as the effective removal of WBCs. Moreover, it does not affect the viability of parasites. The high concentration of PRBCs and the low degree of WBC contamination obtained by magnetic method are very useful for experiments on the biochemistry and molecular biology of the parasites.